It's holiday picture time! Well, at least in my overactive mind it is. I ordered the kids their Christmas outfits later than usual. My fingers are crossed everything arrives by tomorrow. I called the mall and Santa arrives tomorrow. So my goal is to get their traditional Santa pic done by Monday the latest (kids are off for veterans day). Get It Done Tip: Kick off the season now and take the kids to Santa. He's there. There isn't a line a mile long which will waste your precious time. Plus there aren't any coughing sneezing kids around getting your little people covered in germs! It's much more enjoyable to do it now - much lower stress which is always the goal. I usually let my kids watch Santa for a bit before we actually go up for our picture so they can see other kids surviving the experience....the goal being no flip outs. I made tonight's dinner last night so it only needed to be heated up. I found a recipe on pinterest called Grandma's Heirloom Chicken Casserole. I was in the mood for comfort food. My men devoured it so I had about two bites. It was pretty good and really easy to throw together. I changed it a bit, so my version is below. 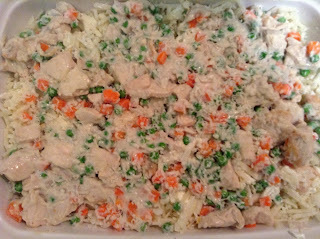 Combine ingredients and spread into the bottom of a baking dish or comparable oval baking dish. Preheat oven to 375 degrees. 4 boneless, skinless chicken breasts cut into bite-sized chunks and browned and cooked through in skillet. Combine ingredients and spread over potato mixture. Bake in oven for 45 minutes until cheese is melted and bubbly.